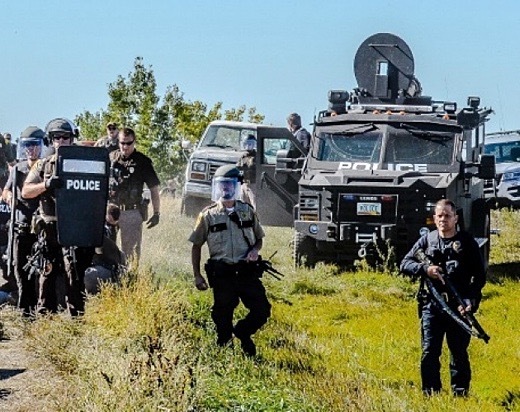 SUBHEAD: Sioux say that "with state police protecting Dakota Access Pipeline that Obama's words are meaningless." Image above: "Roughly 150 peaceful Water Protectors gathered for prayer near construction sites of the Dakota Access Pipeline...and were met with a heavy show of force by authorities." said Rob Wilson, the photographer. From original article. Twenty-one water protectors were arrested in North Dakota on Wednesday after a military-style raid interrupted a peaceful prayer ceremony at a Dakota Access Pipeline (DAPL) construction site. Hundreds of demonstrators have been taking part in the prayer ceremony in recent days, according to the Red Warrior Camp, traveling to sacred sites that are being threatened by the pipeline construction, beginning Tuesday with the ancestral site where private security guards unleashed attack dogs on unarmed protesters earlier this month. Construction was halted Tuesday as a result of the peaceful demonstration. On Wednesday, police helicopters and a circling crop-duster followed the caravan of cars south of Mandan, North Dakota. Image above: Police with military automatic assault rifles stand near Mrap vehicle of the kind of bomb proof vehicle developed to fight "terrorists" in Iraq and Afghanistan now in use by US domestic police forces. From video by UnicornRiot.Ninja. According to the independent journalism outfit Unicorn Riot, which has been reporting live on the Dakota Access protest from the camps, after praying at the second site, "a large amount of police vehicles arrived and blockaded the only exit on the public road leading to the DAPL work site." Dozens of militarized police with shotguns appeared with a Bearcat armored vehicle as well as a [Mine-Resistant Ambush Protected vehicle, also known as an MRAP]. 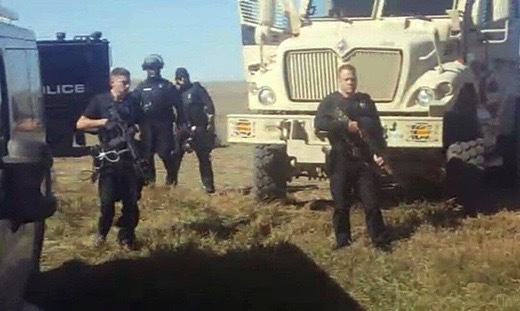 The Bearcat was also brought out by police at yesterday’s action, but the MRAP, a larger tan colored armored vehicle, had not been seen at any DAPL sites until today. The Sacred Stone Camp has started a legal defense fund to support those arrested and others involved in the direct action campaign. Though images and videos of the raid were shared widely on social media, as others noted, there was no corporate media coverage of the arrests. Video above: Water Protectors pray at construction site, met with Police armor and automatic weapons. From UnicornRiot.Ninja (https://vimeo.com/184774821).